John is serving his third term on the R-III Board. “We are truly happy to be able to raise our family here in Pleasant Hill and have them attending the Pleasant Hill Schools. I want to see the tradition of excellence continue that previous generations of Pleasant Hill residents have enjoyed." Edenburn is a Pleasant Hill graduate. 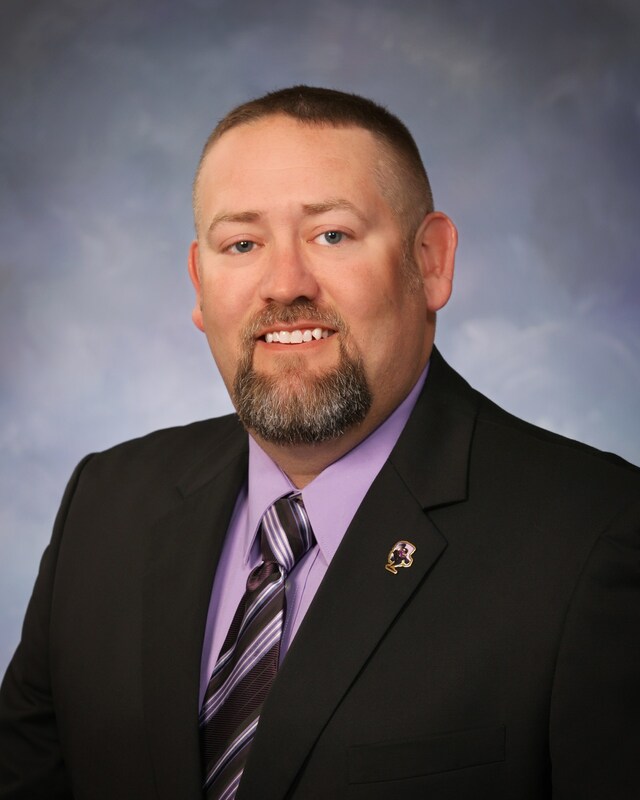 He is the current Board President and the Managing Funeral Director and Embalmer for Stanley-Dickey Funeral Home in Pleasant Hill. He and his wife, Julie have three children. As the manager of a small town funeral home and their three children’s activities he has very little leisure time; but when time allows he truly loves boating, fishing and cross country bicycling. Lori is serving her second term on the R-III Board. Lori is the current Board Vice President and is employed at Diagnostic Imaging Centers as a sonographer. She and her husband, Clint have three children, Lauren, Alexandria and Zachary. Her leisure time consists of reading, socializing with friends and whatever the kids have planned for her. David is serving his fourth term on the R-III Board. Adamczyk retired in 2007. He was the Primary School Principal for 21 years. He and his wife, Robbien, of 43 years, have 2 sons, David and Joshua, both PHHS graduates. His leisure time consists of spending time with grandchildren, traveling, golf, fishing and helping others. Ryan is serving his second term on the R-III Board. Vescovi is the owner of Guido’s Pizza. He also owns KiDZ Inc. Child Development Center which was established in 2009. Being a local business owner, he is busy in the community as a member of Chamber of Commerce, United Way and NFIB. He and his wife, Lisa have four children, Savanna, Jackson, Jasper and Jagger. Deenia is serving her second term on the R-III Board. Hocker is currently a Special Education Coordinator of two buildings, for the Raytown School District. She has worked in education, in a variety of rolls, for 20 years. She and her husband, Clay have two children. Her free time typically involves driving to practices or attending her kids’ games. When not in the car, she enjoys spending time with family, extended family and friends. Travis is serving his second term on the R-III Board. Ross has been an electrician with Eldecon, Inc. for 23 years, own and operated Travis Ross Renovations and general contractor for the Federal Home Loan Corporation. He and his wife, Laura have 5 children. He enjoys going to the lake with his family, hunting, fishing and attending the many activities his children are involved in. Todd is serving his first full term on the R-III Board. "I chose to run for the R-III Board of Education because as a second generation “Rooster”, knowing the community and its history can be a valuable resource for current issues as well as planning for the future. I want to be a part of the ongoing tradition of excellence that our district strives for. I am excited to be a part of the positive growth of our district. We need to keep education and opportunity for our kids at the center of our discussions, while providing adequate support to our teachers and staff." Wilson owns and operates T.C. Wilson Insurance Group in Pleasant Hill. He and his wife, Nici, have two children, Tyne and Truman. They live on their family farm with a small herd of commercial cattle and both kids are very active in showing livestock at the local, state and national level. When not showing livestock, Wilson enjoy's coaching and watching their kids participate in various sports throughout the year.